Gallery25N alongwith artcompetition.net/ have organized a competition for artists all around the world. The theme for the competition is 'Still Life' and it's a group competition category. Gallery25N is a online virtual art gallery which has international recognition. 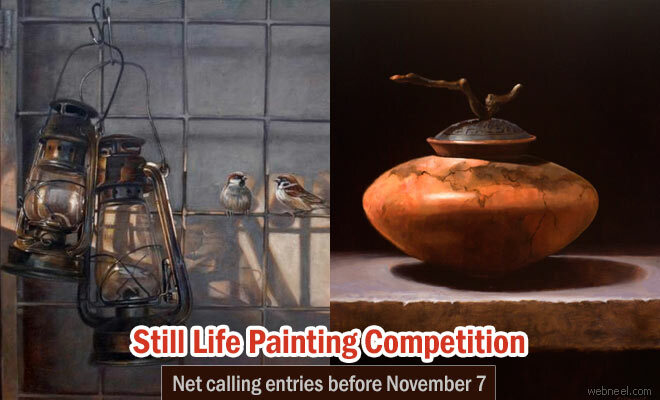 The last date for submission for 'Still Life' paintings are November 07, 2016. The judging will be done on November 14, 2016 and the winners will be notified through mail on November 17, 2016. The winning entries will find a place in the exhibits in Gallery25N. The competition is open to all people who are aged 18 and above. Entries must be created in a still medium: painting, drawing, photography, sculpture, digital, prints, fiber art, collage, etc. According to artcompetition.net/,"“Still Life” - For this group exhibition the curators will be looking for still life artworks that convey a captured moment in time. The still life works can be traditional or contemporary in nature, with the content exhibiting everyday objects which are natural (e.g., food, flowers, game) or which are manufactured (e.g., bottles, glasses, pottery). The subjects of the art can range from a single object to a complex arrangement of objects expressed from representational to abstract. The still life art genre may appear simplistic; however, it frequently reveals a subtle insight into various cultures that are uniquely different from our own. Still life works reflect a deeply personal view into the artist’s daily life. Selections for this exhibit will be based on originality, quality of execution, and the communication of the subject". Entry Fee: $20 for the initial entry and $10 for each additional image. Still Life Art competition calling for entries before Nov 07 2016 Neel Gallery25N alongwith artcompetition.net/ have organized a competition for artists all around the world. The theme for the competition is 'Still Life' and it's a group competition category.